Lake Superior in Ontario, Canada. 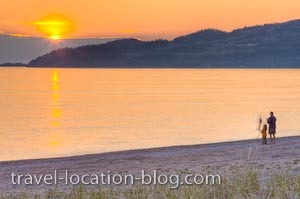 Our second evening out to watch the sunset from along the sandy beach of Agawa Bay in Lake Superior Provincial Park. The setting sun casts shades of orange and yellow across the surface of Lake Superior and sets the sky alight as it sinks down towards a band of thick clouds or fog on the horizon.